This sweet decoration is small enough to fit in any little nook, but pretty enough to be displayed on your favorite wall. 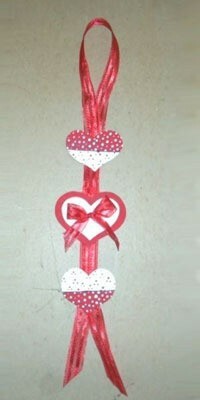 Both children and adults can have fun creating this wooden heart and sheer ribbon craft. Paint the large heart solid red. Paint one small heart white. Take two smaller hearts and draw a light line across the middle. Paint one smaller heart red on the top and white on the bottom. Paint the second smaller heart white on top and red on the bottom, as shown in the "Step 1" picture. Let dry. Paint polka dots on the two smaller hearts. Use big and small, white, polka dots on the red parts. Use big and small, red, polka dots on the white parts, as shown in the "Step 2" picture. Let dry. Paste the white heart on top of the red heart, as shown in the "Step 3" picture. Paint or draw a thin black line across the color break on the two, smaller, red and white hearts. Let dry. Cut about 6 inches from the ribbon. Tie the cut piece into a bow. Cut off any ribbon ends that hang too long. 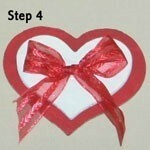 Glue the bow to the middle of the white heart on the big red heart, as shown in the "Step 4" picture. Let dry. Loop the remaining ribbon, lining up the ribbon ends. Glue the hearts on the ribbon, as shown in the finished project picture. Let dry. Thank you for sharing this. I love hearts and am decorating my kitchen in black/white with red accents (for the hearts, lol). This will be cute in there.